A few months back Casey Trees was invited to participate in an episode of Renovation Nation for Discovery Channel's Planet Green. In the midst of the lights and cameras - as you can see above - a star was born. 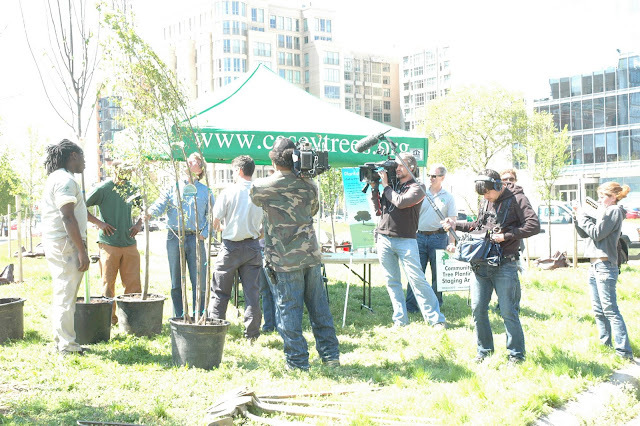 While the majority of our phenomenal field crew participated in the filming, Jim Woodworth, Director of Tree Planting, served as Casey Trees' spokesperson walking the host of Renovation Nation, Steve Thomas, through the tree selection and planting process. So far Jim has not let all the fame go to his head. He is still the same down to earth urban forester you all have come to love over the years. The air date for our episode has finally been announced. Drum roll please. Friday, August 7, 2009 at 9:00 p.m.
You can find Renovation Nation on each of the below channels. Remember to set your Tivo! JOIN THE CASEY TREES TEAM! WHAT ARE CITIES DOING TO PROTECT TREES?